It makes me smile whenever I see it with the whimsical green angel kitty painted in reverse on the back side of the glass. 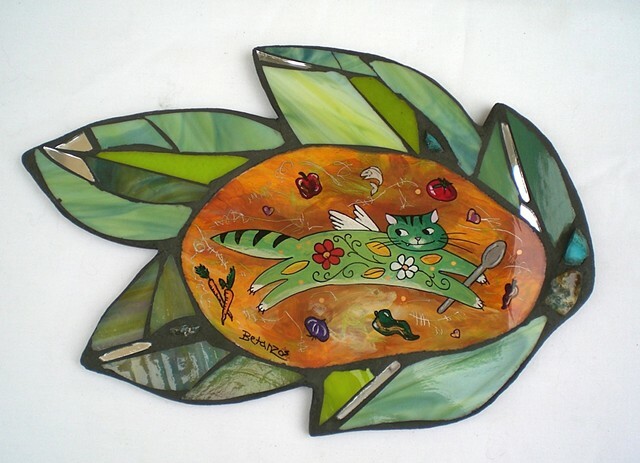 Glass Mosaic with reverse glass painting kitchen kitty angel by Sue Betanzos. Finely detailed reverse glass painted Kitchen Angel Kitty! On a stained glass basil leaf. Stained glass, mirror, hints of glitter and turquoise complete this cheerful, sweet mosaic.